The Tampa Bay Buccaneers got their man in the 2018 NFL Draft, even by trading down in the first round and accruing extra draft capitol in the process. The Bucs traded down from the No. 7 overall pick to No. 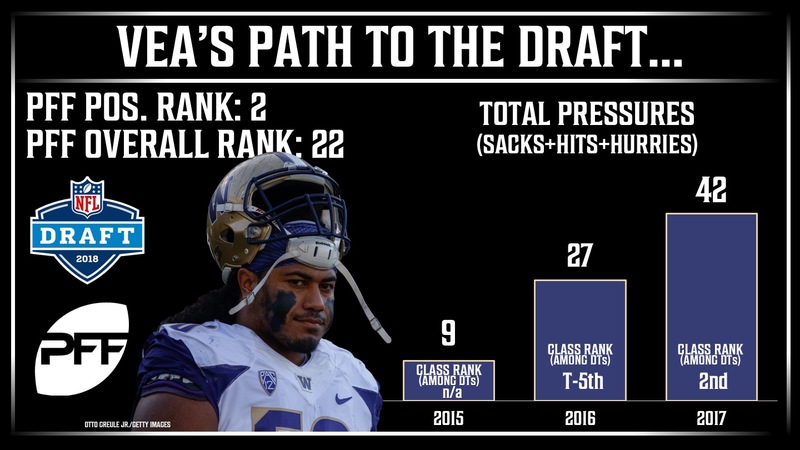 12 and were still able to select interior defender Vita Vea from Washington. Vea essentially completes the revamping of the Buccaneers defensive line they spent all offseason working on, adding a strong component next to All-Pro Gerald McCoy. Vea was stout in run defense at Washington while holding his own when rushing the passer. He accumulated a total of 42 total QB pressures from the interior of the Huskies defensive line in 2017 alone, typically winning with his shear power and strength, something that may not come as easily in the NFL. After Vea, the Bucs selected a position of great need in the organization, even if the value of the running back is rapidly decreasing in today’s NFL. Ronald Jones II had the nation’s highest grade among running backs last season, so selecting him in the second round provides great value at that spot. M.J. Stewart and Carlton Davis capped the Bucs second round as they doubled down on the cornerback position with the duo from UNC and Auburn, respectively. Stewart had a strong year last season and has extensive experience in the slot, arguably the league’s most undervalued position. Davis allowed just 25.0 percent of passes thrown his way to be caught in 2017, the third-lowest among cornerbacks in the draft class. Lesser known Alex Cappa from Humboldt State finished off the Bucs second day of the draft as Tampa Bay has had success previously with smaller school offensive lineman, see: Ali Marpet. They continued the lesser known on Day 3, grabbing University of Penn WR Justin Watson who excelled at his level. Jordan Whitehead was also selected by Bucs GM Jason Licht, as he has seen his grade go in the wrong direction during his time at Pittsburgh. He had 29 defensive stops in 2015, his best season as a Panther, showcasing what the Bucs hope he can bring with him to Tampa. With their final pick of the draft, the Buccaneers selected Wisconsin LB Jack Cichy, who sat out all of 2017 with an injury sustained just before the season. In 2016, Cichy was dominant, finishing the year with an overall grade of 89.0 and had impressive performances against strong competition in the Big Ten.